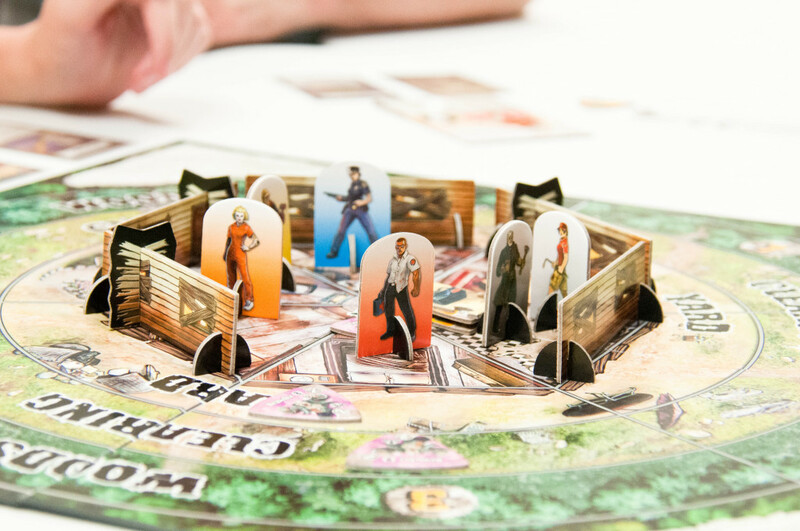 We seemingly never tire of zombies, zombie games, and zombie-related nonsense around here…! 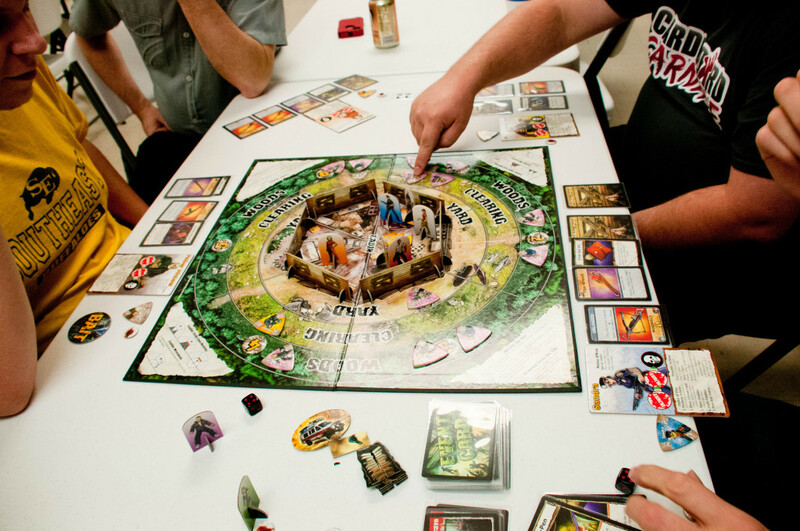 It may not be for everyone, which is fine, but there’s just something about the survivalist aspect and the team work aspect and the fear of brain eaters that intensifies the fun when playing games with humans versus zombies, us versus them. 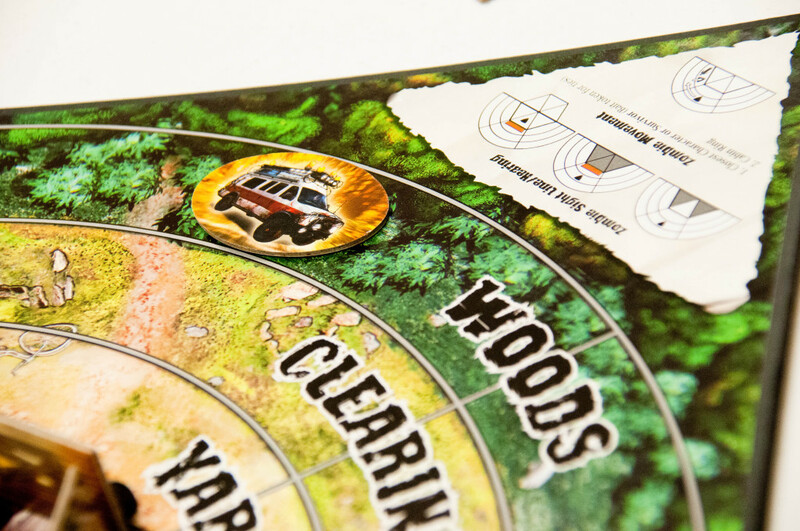 Dead Panic is another one of those types of games; the humans work together to protect the walls of their cabin, help survivors come in from the woods, and fight off zombies until they are able to retrieve the three radio parts from the three survivors needed to assemble the radio, call for the van, and then make it out to the van alive and speed away! Since our characters don’t start the game with any items, we immediately started drawing cabin cards to search the place for anything and everything that might fend off zombies. After 2 turns, my character, Ray had collected an epi-pen (to add +1 to melee combat), hammer & nails (to rebuild a wall if the zombies tear it down), a machete, and trail mix (allowing my character to move up to 3 spaces at no action cost). No shooting weapons yet…. 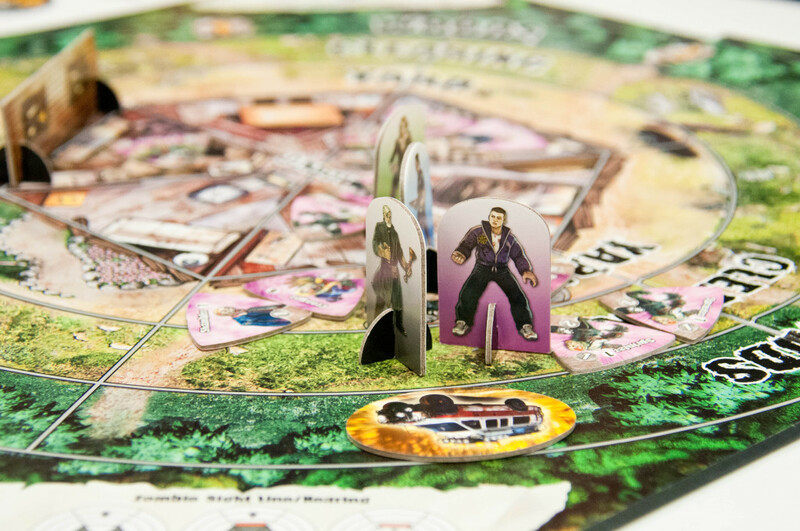 I, also, at this current time, had the bait token which means that when zombies move at the end of the round, they would move closest to my character using sight and sound, and they would fight my character first if there were multiple characters in one space with zombies. Joy! The bait token is passed around clockwise so that everyone gets the same opportunity! 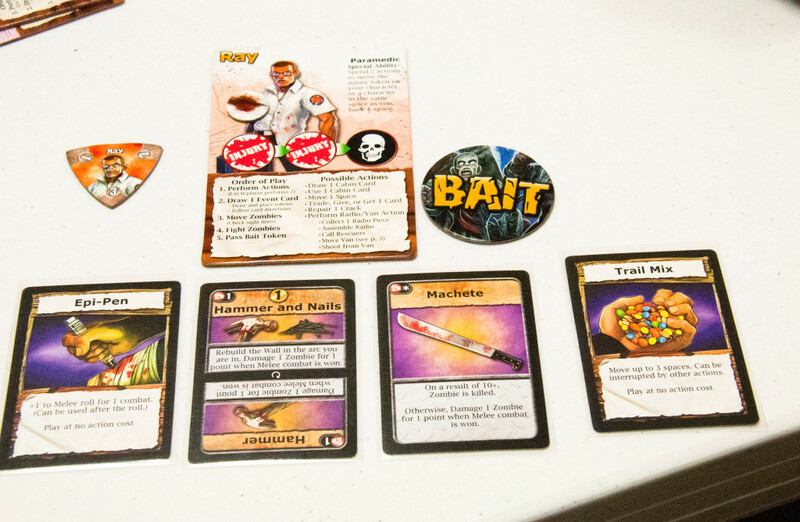 When a character is searching the cabin by drawing cabin cards, usually, the items are good to have, some items are great, one item in particular happens to be a zombie instead…. It just so happened that my character drew this card for BOTH games played. I say, “GRRRRRRRR!” to the Graaaaaaagh! card! 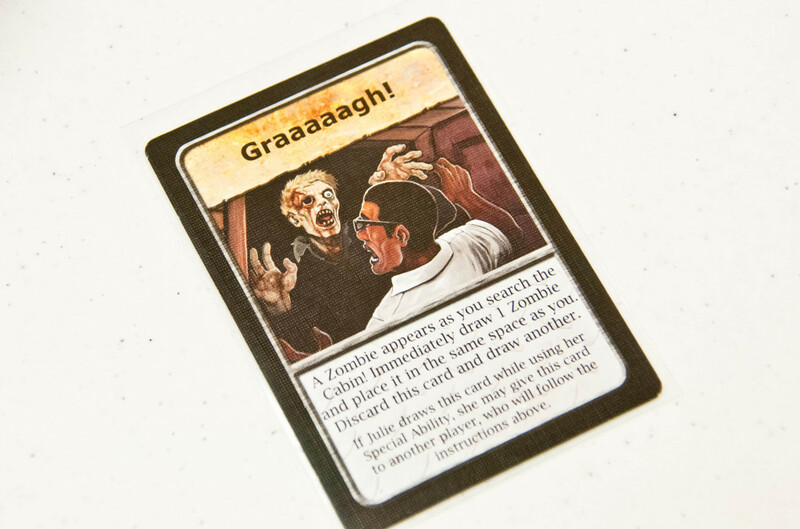 Let me tell you that if/when you draw this little gem, you will first feel shock and horror that it was a zombie hiding in the same room as you, and then you will feel utter disappointment to realize that you wasted a draw action on that dang zombie. Draw again. Move on. 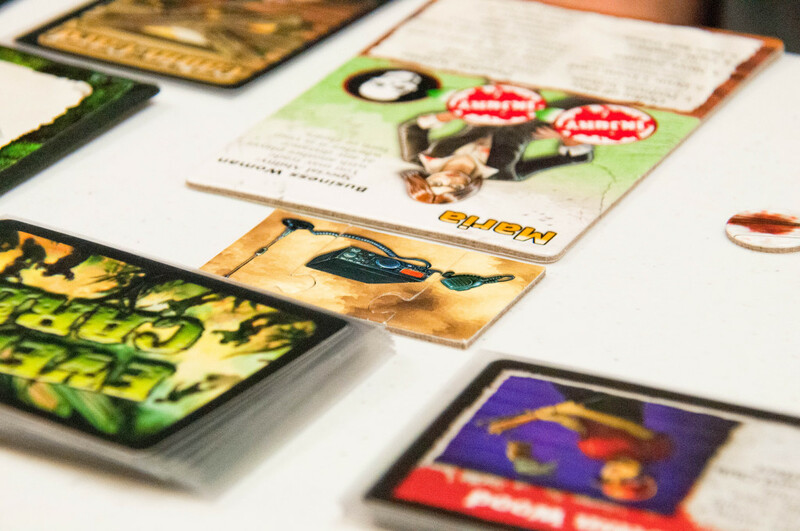 then 1 Event Card is drawn which dictates how many new zombies are placed on the board and any additional stipulations for the zombies movement, i.e. zombies move two spaces or zombies move clockwise, etc. 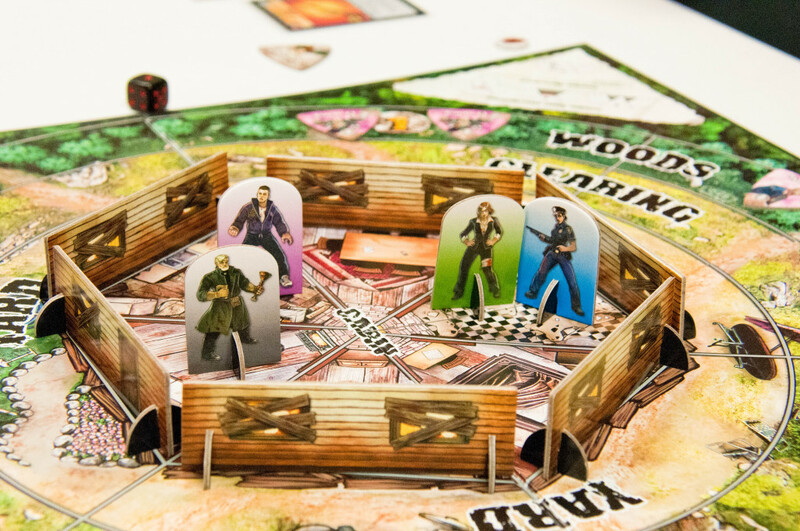 A die is rolled for each zombie to place them in an arc on the game board. 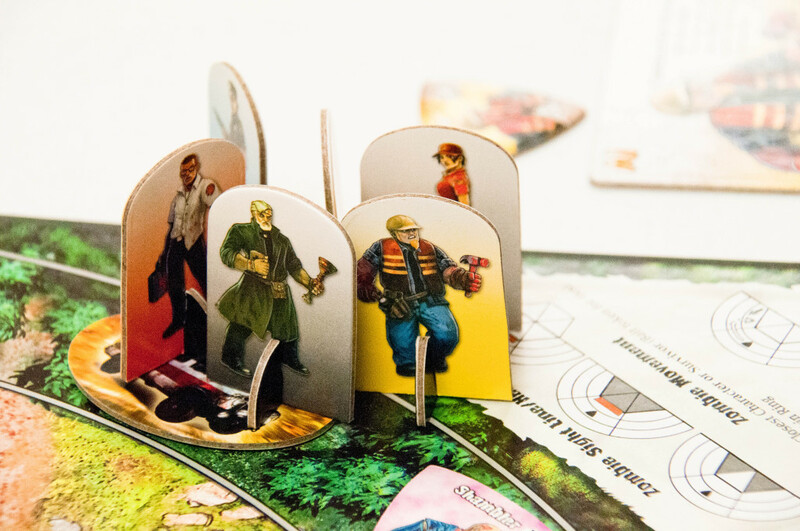 After the zombies have been placed on the board, they move. Creepers only move on a roll of 4+ and they slip through walls once they reach the cabin. Shamblers, brawlers, and brutes each move one space; shamblers and brawlers crack the wall with one hit, while brutes take the entire wall down with one hit. The Sprinters move 2 spaces at once and crack the wall with one hit. Ray decided to rebuild the wall – better to be safe than sorry this early in the game – wall preservation can be very important. 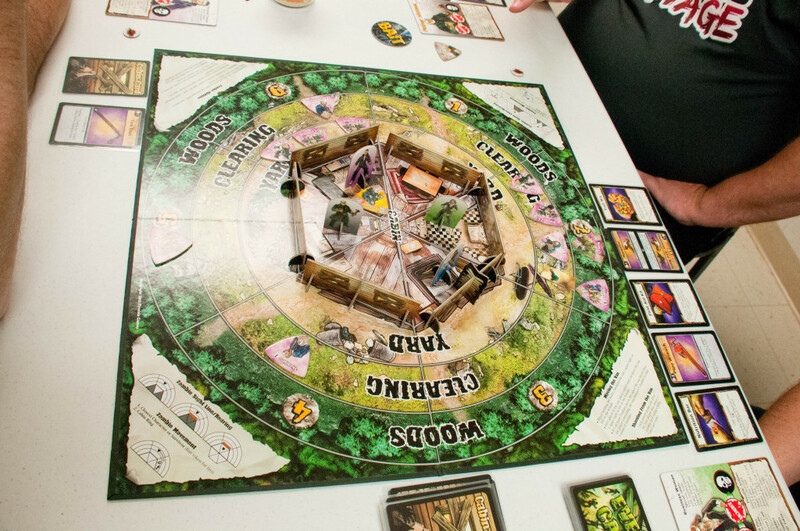 The zombies continued to spew out of the woods attempting to overrun our hideout. It’s at times like this when we started to panic…. 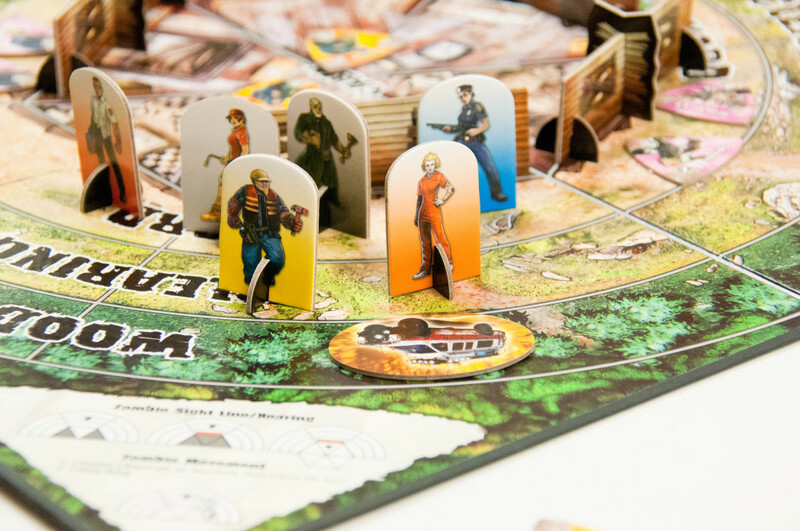 2 brutes, 3 shamblers, and 1 brawler were all in the same arc on the board, which meant that they’d most likely, easily break down a wall and infiltrate the cabin. 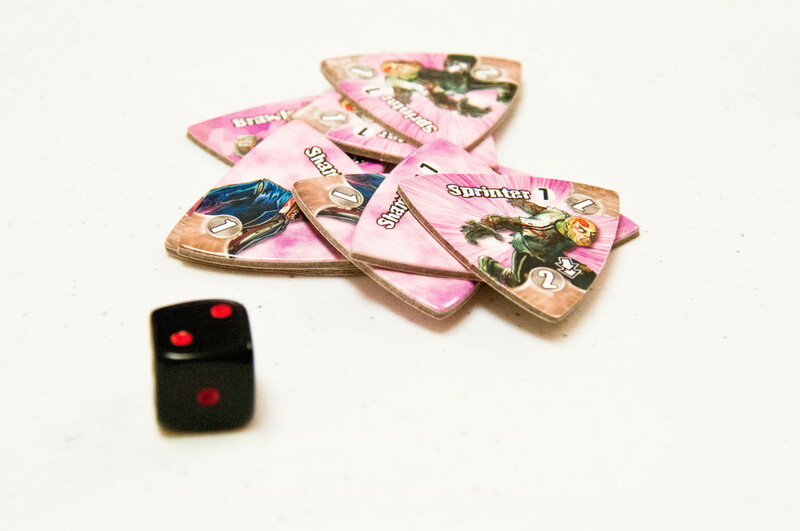 Look at how tough the brutes are – they have a fight value of 9, meaning that a character must roll a 9 + in order to tie (so that nothing happens) or to damage the zombie for 1 point. 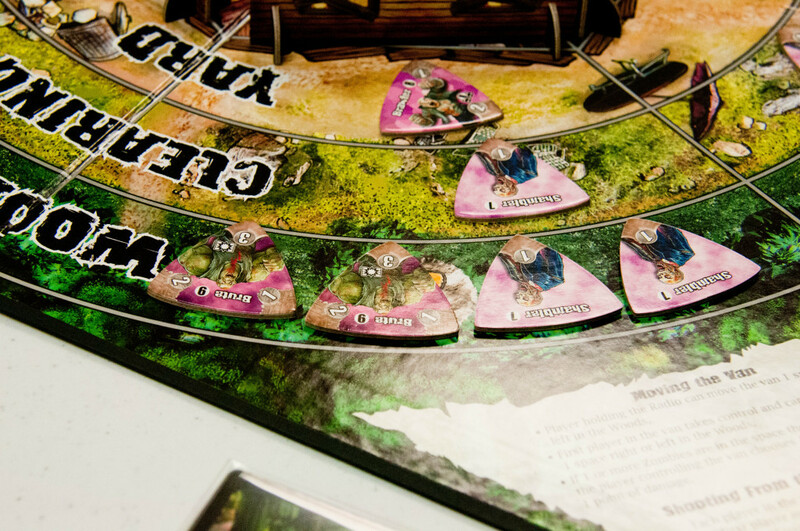 Brutes must be damaged for 3 points in order to die and be removed from the board. 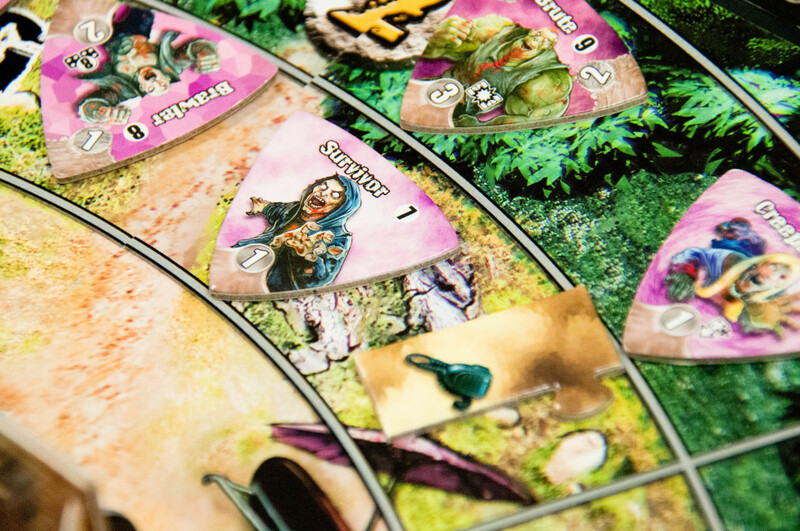 And, just a little side note, the zombies may be killed and removed from the board, but each time the bag ‘o zombies has emptied, then ALL of the discarded zombies go back in the bag to be drawn again. Over and over and over again. Whilst we were defending the cabin, our resident delivery driver, Julie had possession of what would later be named, The Magic Rope! 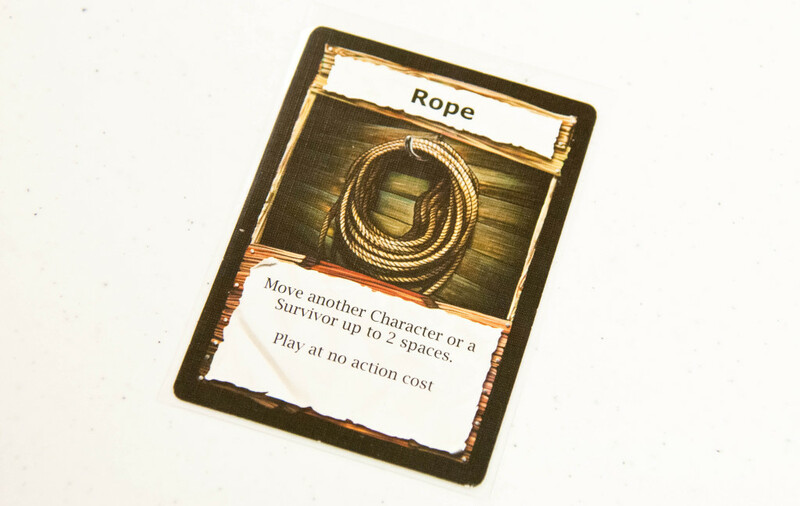 Now, nowhere on this card or in the instruction manual does it specify that this rope card is a one-time use OR that it must be used within line of sight. And, so, Julie used her rope in all kinds of magical, improbable, unrealistic ways to pull survivors into the cabin. Once those survivors were in the cabin they dropped a precious radio piece, which we desperately needed to assemble the radio in order to call for help. *It was later clarified by the online Dead Panic FAQ that the rope, as well as any other “item cards,” are all considered one-time use and are to be discarded after that initial use. Also, we voted that common sense would tell us to use the rope as a means of rescue if a survivor/character happen to be in the same arc, in line of sight. Soooooo, we feel as though the magical rope may have given us an unfair advantage during this game. Indiana Julie expertly wielded her magic rope to rescue 2 survivors. Once we had all 3 radio pieces, she assembled the radio and called for the van. 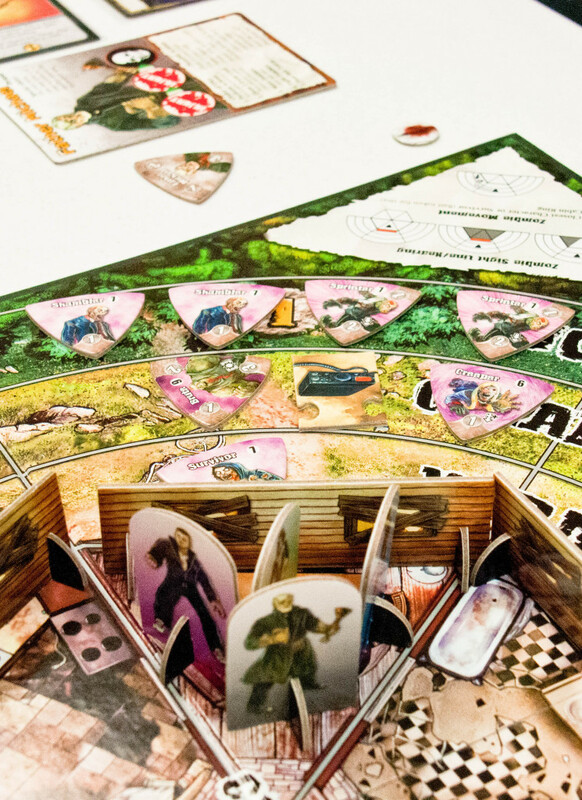 When the van arrived, a die was rolled to place it in one arc in the woods. The person who assembled the radio, holds onto it and has the ability to move the van left and/or right, but never out of the woods. It stays in that arc furthest from the cabin requiring ALL of the characters to bust out of the cabin and make a run for it. 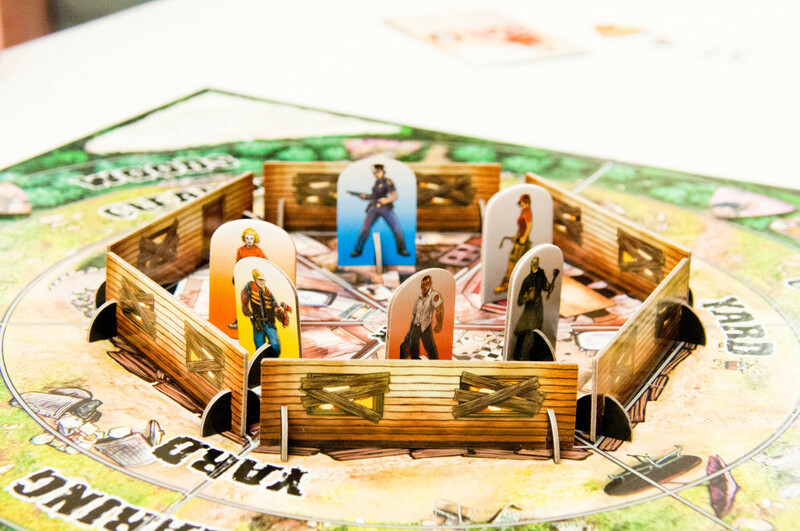 A couple of things: characters may move through cabin walls at no extra cost, but the movement still costs one action. Human movement, in and out of the cabin, is allowed through any of the walls, rendering the door in the living room moot. Yes, I said, moot! As a group, we agreed that this mechanic was a little weird, and it made me personally feel as though I had some creeper-esque zombie-type properties to be able to take such liberties… If the game didn’t want us to use our magic rope to pull a survivor through the window on the far side on the cabin, then why should we be able to slip through a wall like a zombie? We all agreed that the verbiage should state that we are escaping through the windows instead. IF your character takes his/her maximum number of injuries from zombie attacks, then that character dies and comes back as a zombie with new, different zombie actions and abilities. Also, if and when the survivors die after fighting zombies, they drop the radio pieces that they were carrying (wherever they happen to die) and they also turn into zombies. The van was called and placed in the woods. Here, we see my character, Ray being surrounded by a group of hungry brain eaters… All the while, we also see that he’s being deserted by the rest of the group. If you’ll notice the turkeys running off to the right of the photo (above). No matter, the paramedic ended up taking 2 injuries, but he stayed alive long enough to fend off further attacks and move OUT and AWAY from the hoard! Everybody making a run for the van! While the game was a lot of fun, what with Gregg rolling poorly, Erik rolling moderately, and Sam taking over rolling duties when placing zombies in the arcs, plus all of the debate surrounding the magic rope, added to the super serious chanting of “SHOOT THE BRUTE,” it’s always a good time hanging out with these guys, but as a whole, we felt like the game was much too easy. Hmmm, let’s figure out what we were doing wrong. This caused us to do a little online research about the previously mentioned rope. We were also off a little bit with the zombies’ movement mechanism. The zombies move sideways in the arcs towards any human characters/survivors (line of sight & smell), instead of always moving straight toward the cabin. We had to give the game another try with proper movements and a one-time use of the rope. We were down a couple of players for the second game, but spirits were still high! We’ve got this! 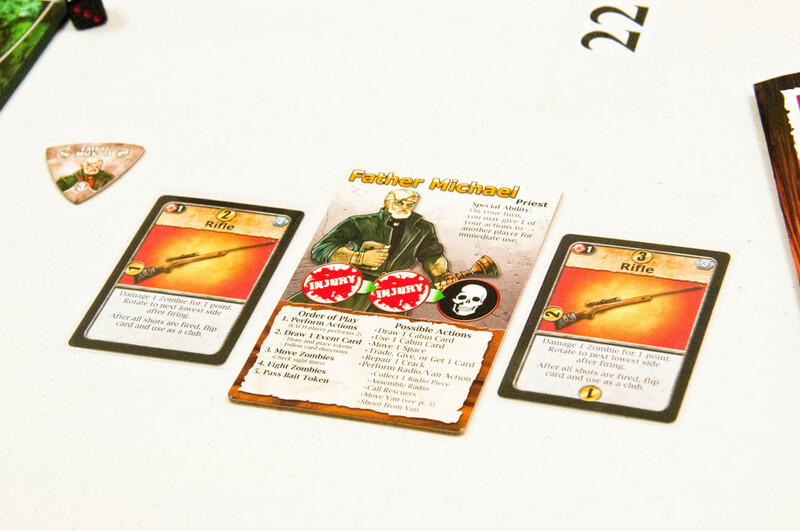 Father Michael used his first 2 actions of the game to draw 2 rifles – WOW! We’ve definitely got this! He saw a survivor and his bravado got the best of him. He rushed out to assist. His idea was to protect the survivor from zombies so that she could safely make it into the cabin and drop her radio piece. He endangered his life, but his risk paid off! First survivor was safe inside along with the first radio piece. Now, get back inside the cabin, David! 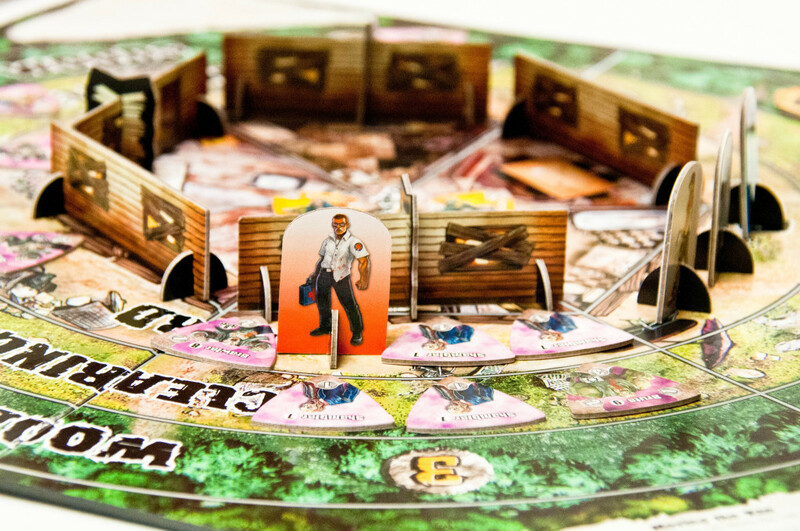 Our second survivor wasn’t so lucky… He fought and injured 3 zombies, but ended up dying and reanimating. So, our second radio piece was lying on the cold, cold ground outside of the cabin. Using our character’s special abilities, we were able to send Maria the business woman out to get the radio piece and quickly pull her back in with the perfectly legal, one-time use of the rope! Two radio pieces down, one to go! 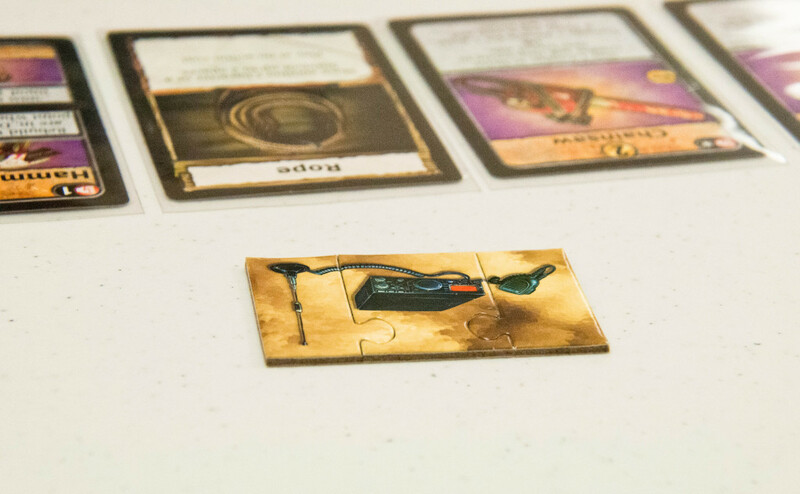 And, of course, that last piece ended up being dropped by a survivor-turned-zombie, outside, smack dab in the middle of a group of flesh eaters…. 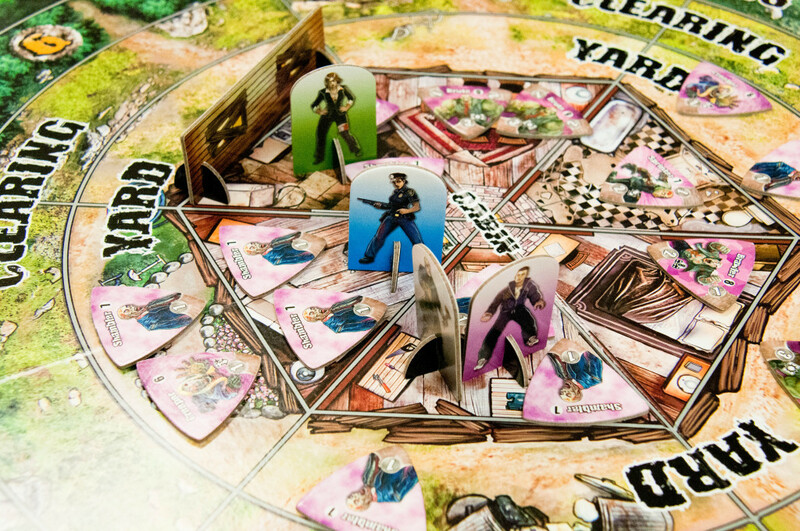 All of our characters were packed into one space behind the cabin wall awaiting the imminent charge of zombies. Up to this point of the game, I think that we all agreed that things were still going swimmingly well. Each character was using his/her actions wisely. Each character had a reliable weapon, be it ranged or melee. We were making good choices. But, it started to seem like the threat of being overrun was more realistic this time around. Never fear! David to the rescue again! Hopping out the window in this cracked wall, he grabbed the third radio piece, hurried back inside, and gave it to Maria. Maria assembled the radio and called for the van. 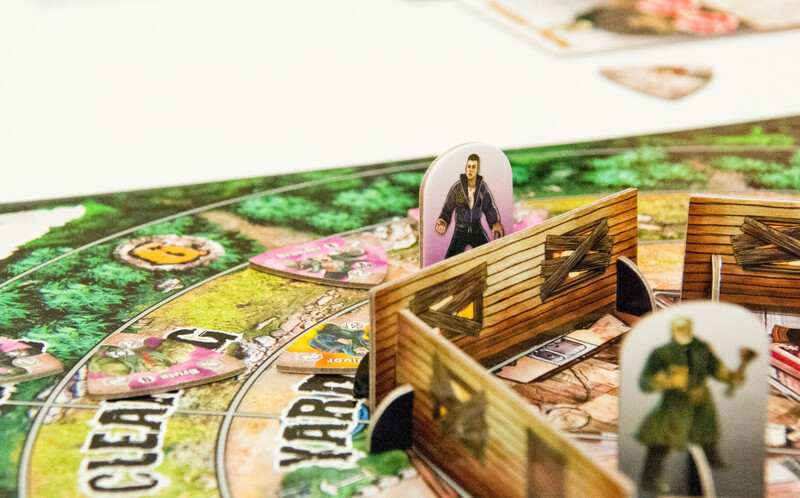 And the van arrived just in time because our cabin was down to ONE wall left standing, zombies in EVERY room…. Time to RUN!!! David had a card called Zombie Muck, which allowed him to remain unseen by zombies for one turn. He took this opportunity to sneak right past the zombies and head for the safety of the van – smart move! We all eventually made it to the van. There was a bit of sharp shooting involved, by the characters who were already inside of the van, to help clear the way for Father Michael. While we were still able to win, without receiving any injuries or turning into zombies, this second game was a bit more challenging. Since we weren’t able to pull the survivors into the cabin as easily by using the rope multiple times, they had to fight more zombies outside of the cabin. They ended up dying and reanimating outside of the cabin. Hence, our much needed radio pieces fell outside of the cabin, which made it more challenging to collect them. 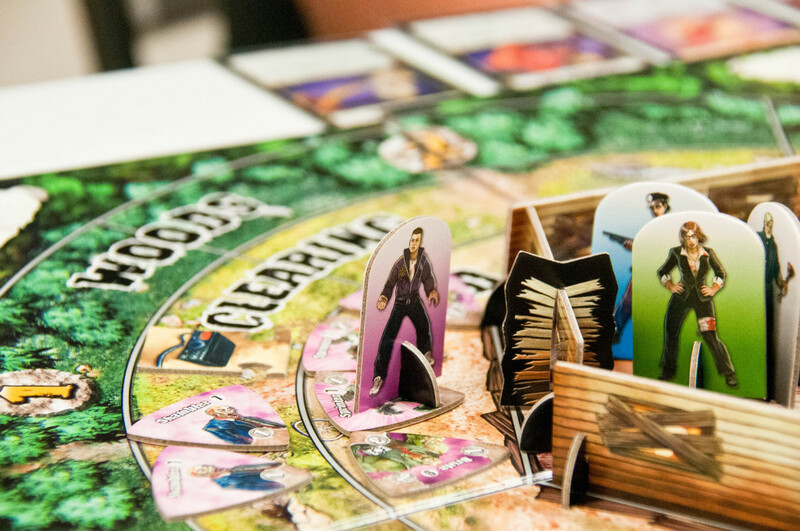 Get into your character, develop a story, and have a fun, zombie-fighting time!